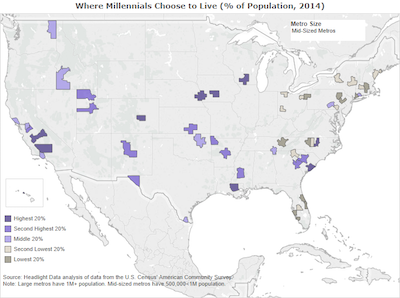 Recently released data from the U.S. Census Bureau’s American Community Survey illuminates which mid-sized metros are host to the greatest percentage of adults aged 25-34, commonly known as the Millennial Generation or Generation Y.
Millennials constitute 13.5% of the U.S. population. Among mid-sized metros, the highest percentage of millennials is found in Charleston-SC (15.7%). Honolulu-HI (15.7%), Bakersfield-CA (15.0%) and Colorado Springs-CO (15.0%) follow. 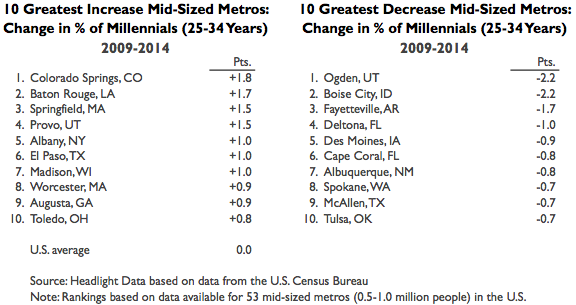 Other mid-sized metros with a high share of millenials are Durham-NC, Madison-WI and Omaha-NE. 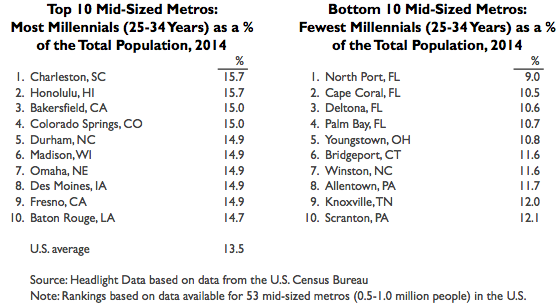 The metros with the lowest percentage of millennials are North Port-FL (9.0%), Cape Coral-FL (10.5%), Deltona-FL (10.6%) and Palm Bay-FL (10.7%). 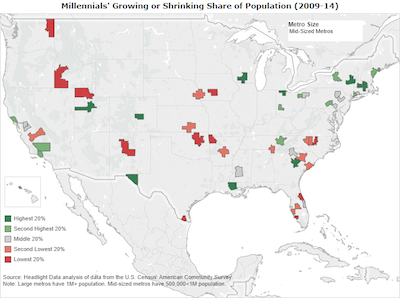 Outside of Florida, Youngstown-OH, Bridgeport-CT and Winston-NC also have a low share of millennials. From 2009 to 2014, millennials’ share of the U.S. population remained constant. The mid-sized metros with the greatest 5-year increase in the percentage of millennials are Colorado Springs-CO (+1.8 pts. ), Baton Rouge-LA (+1.7 pts.) and Springfield (+1.5). Provo-UT, Albany-NY, El Paso-TX and Madison-WI also increased at least 1 percentage point. Ogden-UT (-2.2 pts. ), Boise City-ID (-2.0 pts.) and Fayetteville (-1.7 pts.) had the greatest decrease from 2009 to 2014. Deltona-FL, Des Moines-IA, Cape Coral-FL and Albuquerque-NM also rank in the bottom 10. Research, analysis and content developed by Headlight Data. Original data from the U.S. Census Bureau. Headlight Data is an award-winning online data aggregator, designed for economic and workforce development organizations, that provides online, decision-support tools on the economy, demographics, education, workforce and public policy. Click here to download a spreadsheet of the data.